If sharing is caring, then I’m definitely cared for! Yesterday, I got a delivery from my sister (aka Mango Tomato). She recently attended Eat Write Retreat in Washington, DC where she was the official photographer for the conference. As such, she got a pretty fabulous swag bag and generously shared some of the items with me! Thanks 🙂 If you are interested, you can read about her experience as a photographer at a conference here. Mine is actually magenta in color, which is even cooler! 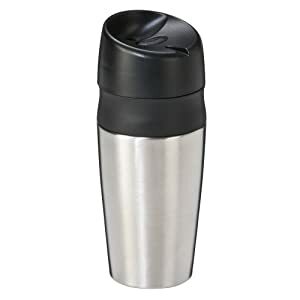 And it’s BPA free, double wall insulated and spill proof. Since I already have a tea mug, this will be dedicated to coffee. 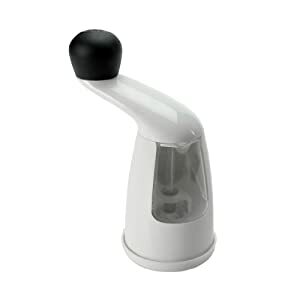 OXO Good Grips Pepper Mill with Pink Peppercorns from My Spice Sage. I love the fact that you can see exactly how much spice you have in the spice grinder. And having the hand-operated handle makes me feel like I’m using an ancient appliances. Trying to figure out what to do with pink peppercorns. Perhaps truffles! Any suggestions from you? And last, but not least, my own purchase! 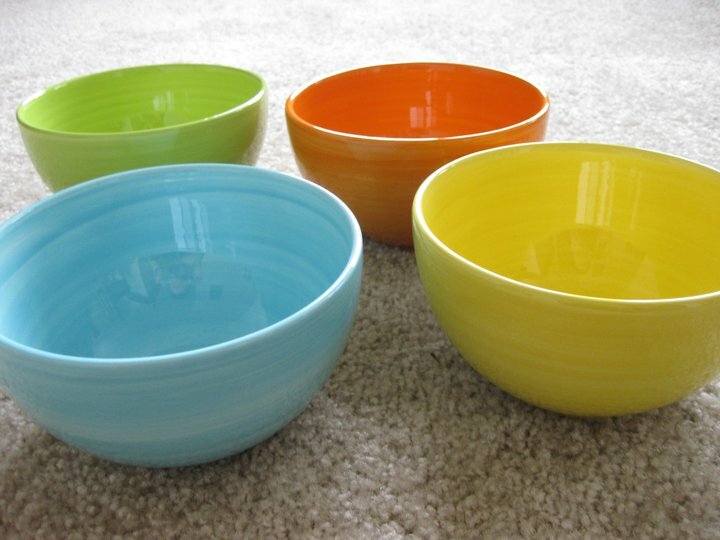 Hand-painted ceramic bowls from Ross. Now, there’s a story about these bowls that I am not going to choose on line, but if you care to find out what it is, please let me know! These bowls are not exactly what I was looking for, but they are definitely an improvement from eating out of a plastic bowl. What’s next in the kitchen? I’m thinking I am in definite need of a food processor and hand mixer. What’s on your list? Cooking doesn’t have to cost an arm and a leg to be delicious and satisfying. Let’s try together these affordable recipes to keep your summer entertaining light on the wallet. Do you love cheese? Come to our kitchen to discover several varieties of goat cheese and learn how to use this versatile cheese in both sweet and savory applications. Learn how to prepare some of your favorite take-out foods right inside your kitchen! We’ll have you covered all the way from appetizers to dessert. As a Culinary Director at the Redmond Whole Foods Market, I get to design and teach cooking classes. When I first started, I wanted to teach a monthly cooking class series called “Cooking with the Season.” In the class, I teach my students how to utilize seasonal, and mostly local produce. This has been by far one of the most popular classes on the calendar. 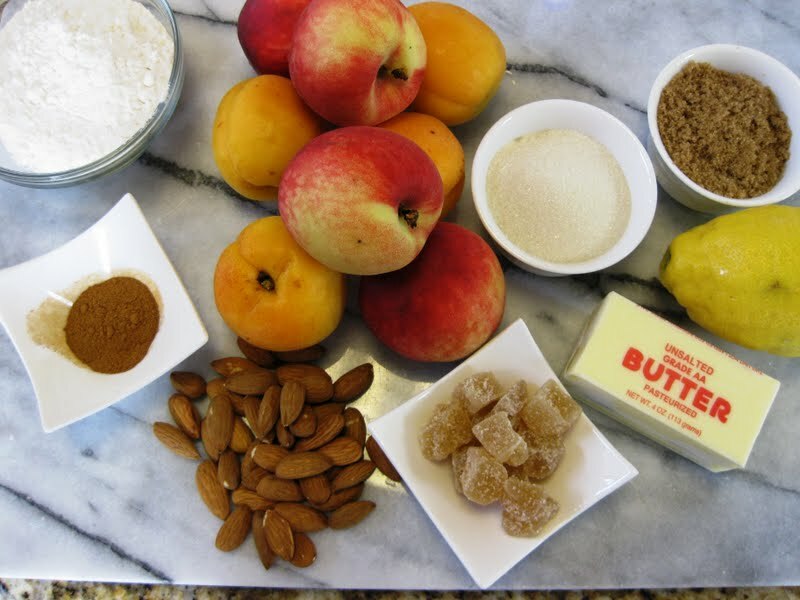 A few days ago, I taught the class how to make a Peach & Apricot Crumble with Almonds and Crystalized Ginger. 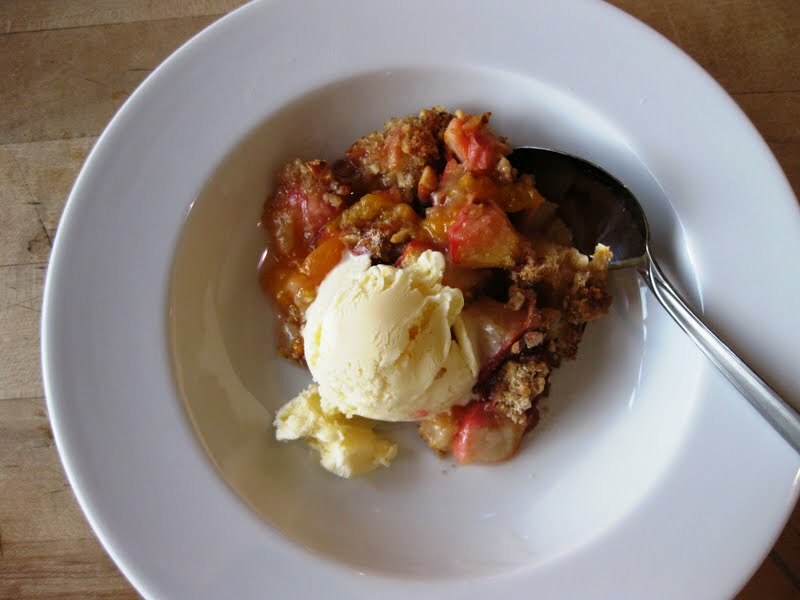 I got the idea for this dessert from the Peach, Blueberry and Pecan Crumble recipe on the Whole Foods Market website. Never one to follow the recipe exactly, I made a few changes. We used apricots and peaches, eliminated blueberries (I’m not a fan of cooked blueberries) and used almonds instead of pecans for extra crunch. The spicy, crystalized ginger is really fantastic, but be sure to dice it pretty finely to avoid biting into a large chunk of heat. 1. Preheat oven to 375°F. Lightly butter a 9-inch square baking dish (alternatively, you can bake it in individual ramekins). 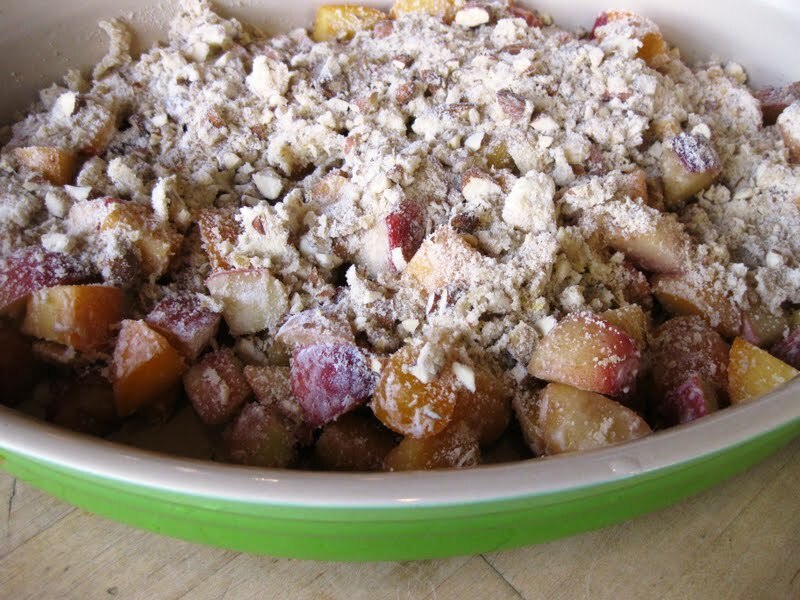 Combine peaches, apricots and 2 tablespoons of the flour and spread evenly in the baking dish. 2. Combine remaining 3/4 cup flour, ginger, sugars, almonds, salt, cinnamon, lemon zest, lemon juice and butter in a large bowl and mix together well with your hands, breaking up the butter with your fingers. Make sure the butter doesn’t break down completely. Sprinkle the mixture on top of apricots and peaches. 3. 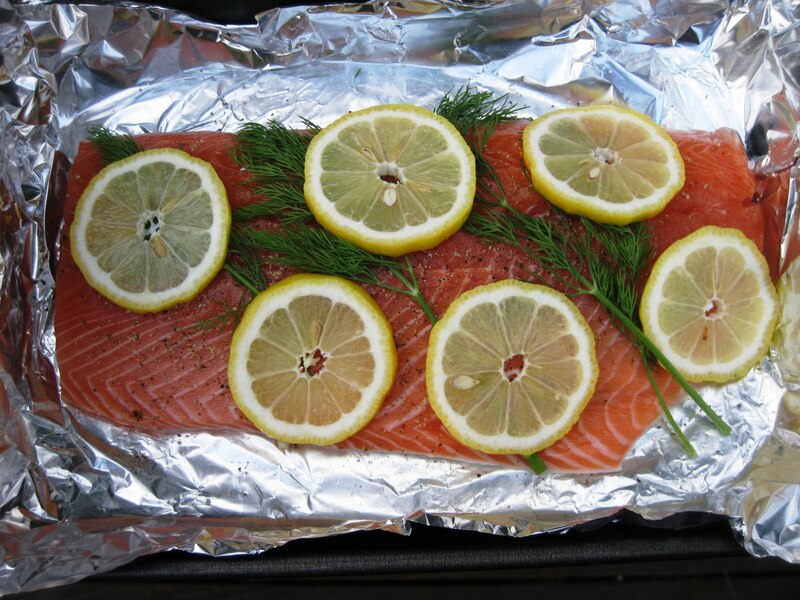 Cover the baking dish with with aluminum foil and bake for 20 minutes. Remove the foil and bake for additional 20 minutes more, or until golden on top and fruit is soft and bubbling. 4. 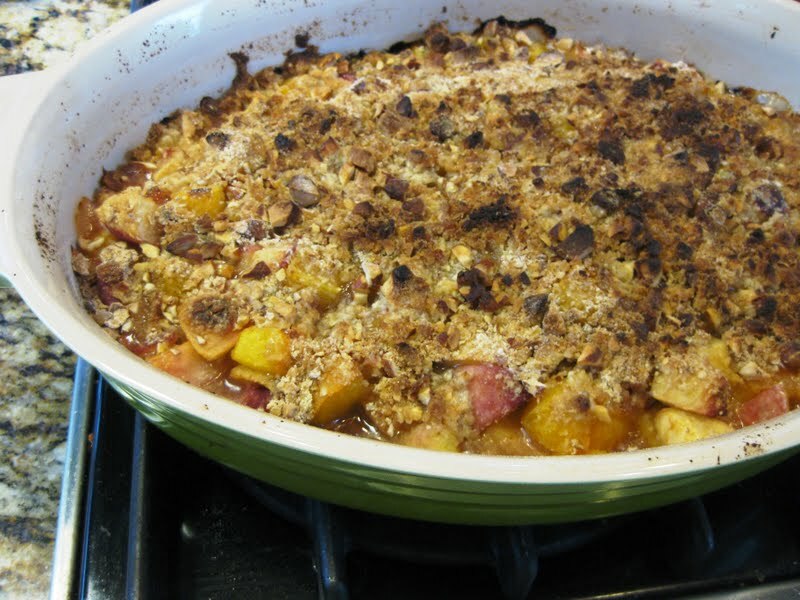 If you are patient, allow the crumble to cool slightly. If not, spoon it up and serve with vanilla ice cream. 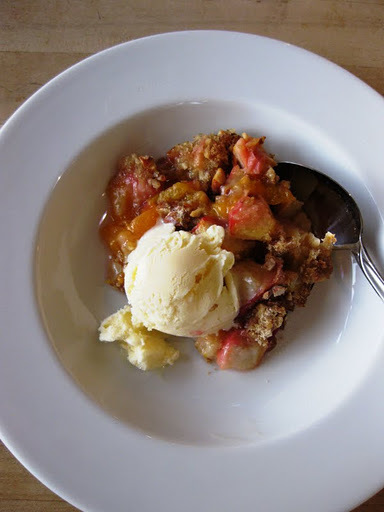 To quote one of my students “this was the best crumble I’ve ever had.” Can you imagine how great this would be once the local markets start carrying juicy peaches and aromatic, sweet apricots? This recipe is very easy to switch up for any season – I’m already thinking of apple and cranberry for the fall. “Will you make cheesecake for your grandmother’s birthday?” was the voicemail from my mom – short and sweet (kind of like the dessert I ended up making). I couldn’t quite remember the last time I baked a cheesecake. Perhaps it was back at the Culinary Institute of America. I consulted the cookbook from the CIA but the recipe in the book was for 8 cheesecakes. Rather than doing the math and deal with scaling ingredients, I decided to go for something simpler. 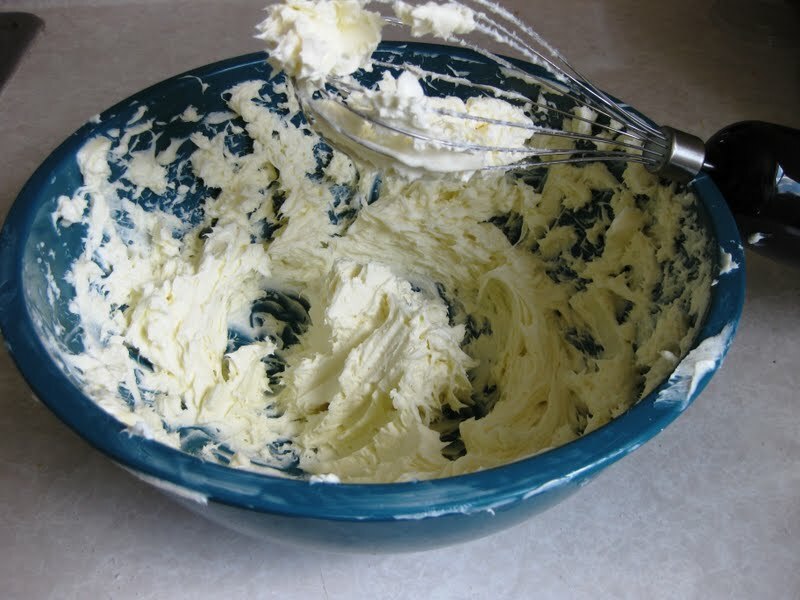 Then, I realized that I don’t own a spring form pan, nor do I have a proper mixer. This could be difficult. Rather than heading out to a local bakery to purchase a cheesecake, I decided to improvise and use my cupcake pan (inspired by so much love from you all for the Sausage & Broccoli Egg Cupcakes) and the whisk attachment from the immersion blender. 1. Preheat the oven to 350 degrees. 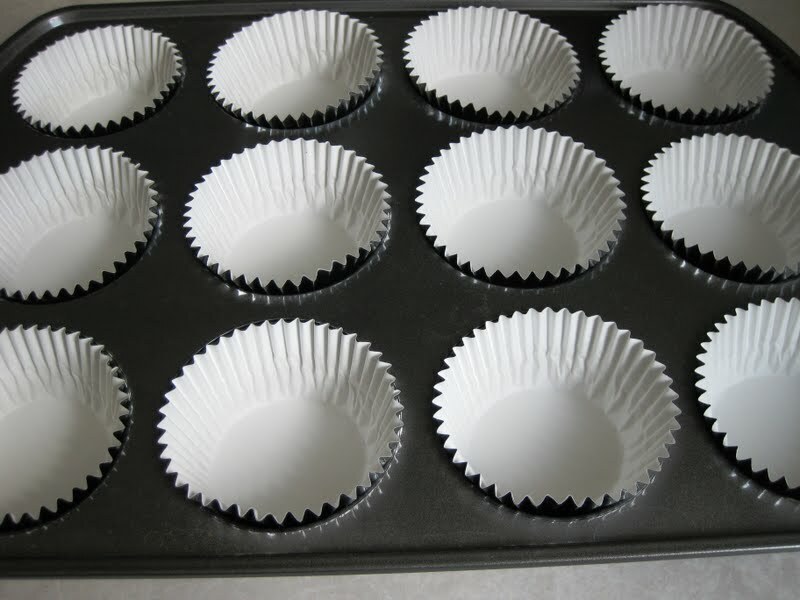 Line the cupcake pan with foil and paper liners. Drain the cherries and reserve the water or juice for later use in the recipe. Place 5 cherries in the bottom of each liner. 2. 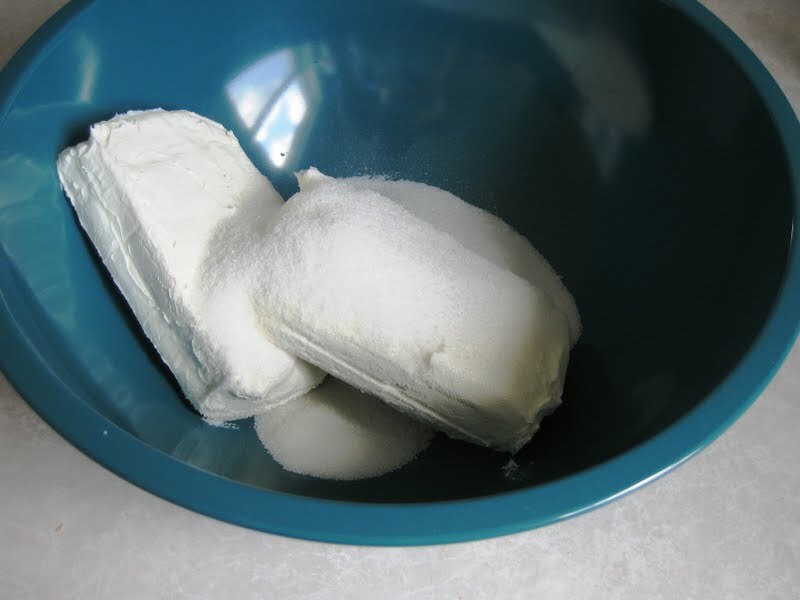 Place cream cheese and 1/2 cup of sugar in a bowl. 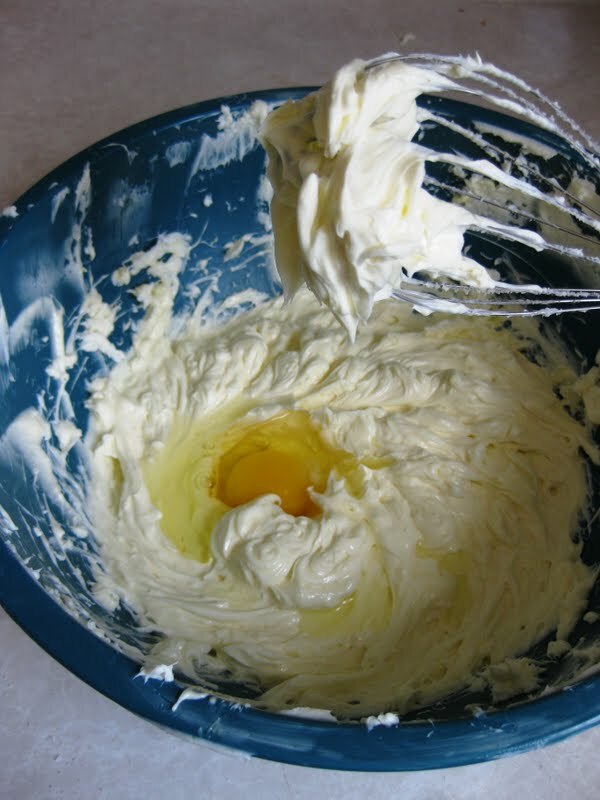 Beat with a whisk until light and fluffy. You should not be seeing any sugar granules by this point. Use a spatula to help you scrape the edges of the bowl. You must make sure that all ingredients are at room temperature. Take your time and allow your ingredients to sit on the counter for at least 30 minutes. Having everything at room temperature will make creaming and combining ingredients easier and you’ll have a lighter, lump-free batter. 3. 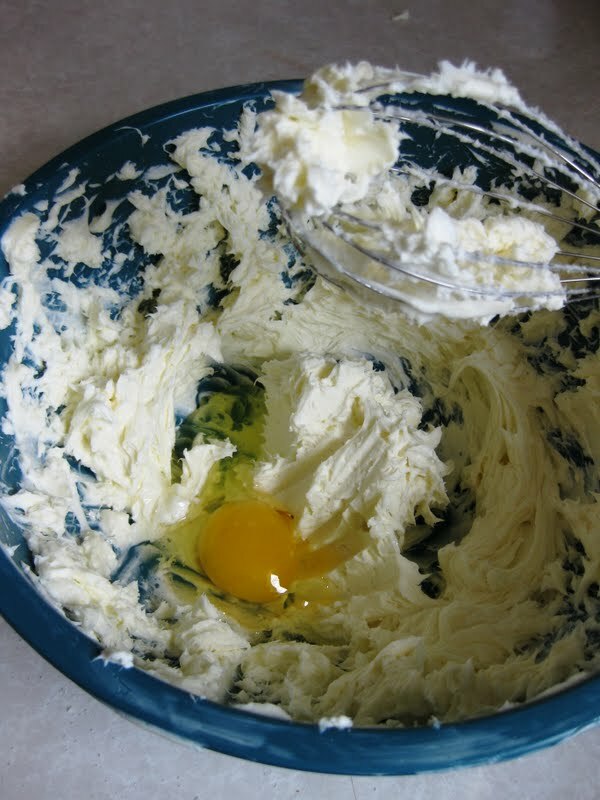 Add eggs, one at a time, fully incorporating into the cream cheese and sugar mixture. 4. 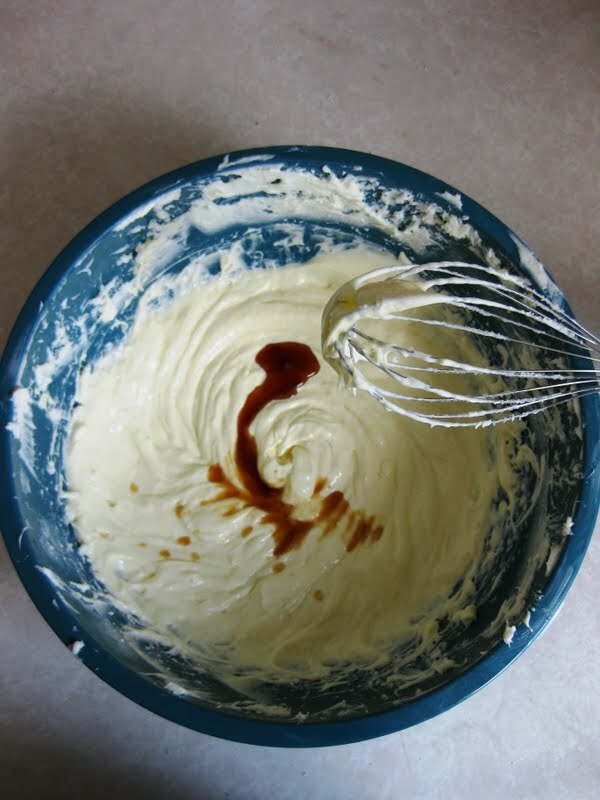 Add a teaspoon of vanilla (no imitation stuff here, please) and whisk. Once the batter is finished, bang the bowl on top of the counter to release any air bubbles – you don’t want any holes in your cheesecake, do you? 5. 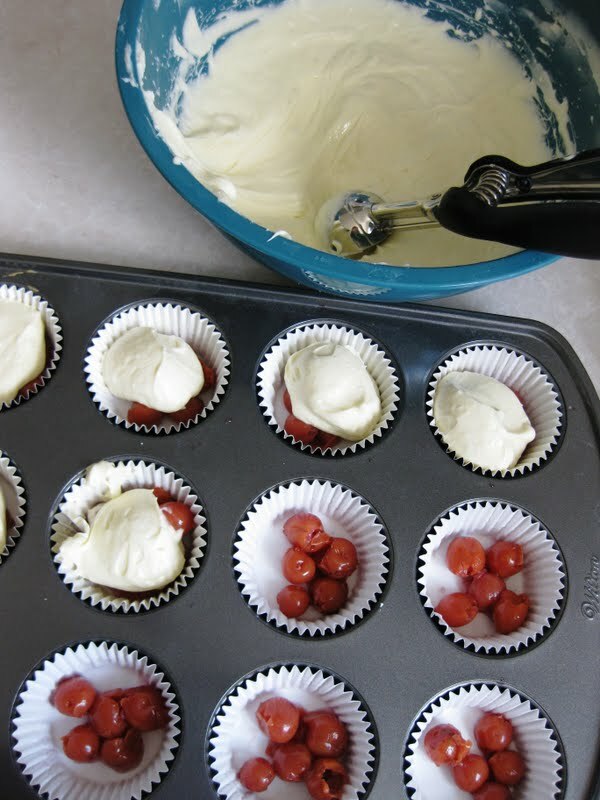 Use a cookie or ice scream scoop to divide the cream cheese batter evenly among the 12 cupcakes (you might have a bit of batter left at the end). 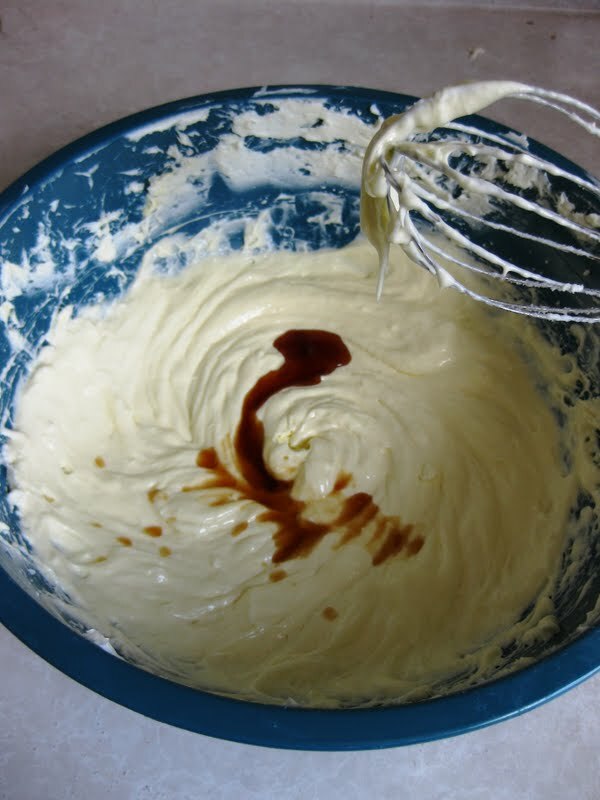 Using a scoop is less messy, and will give you even distribution of batter. 6. 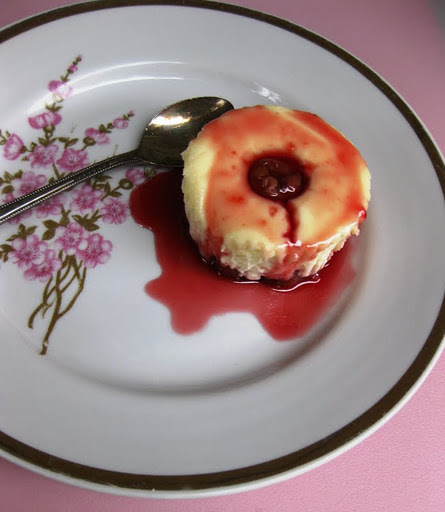 Top each cheesecake with a cherry. 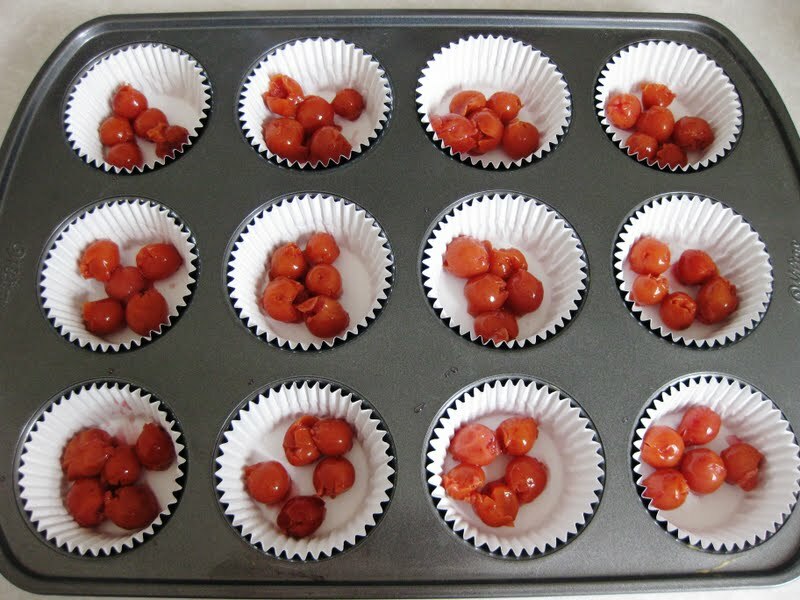 Tap the cupcake baking pan gently to release extra air bubbles and place in the oven. 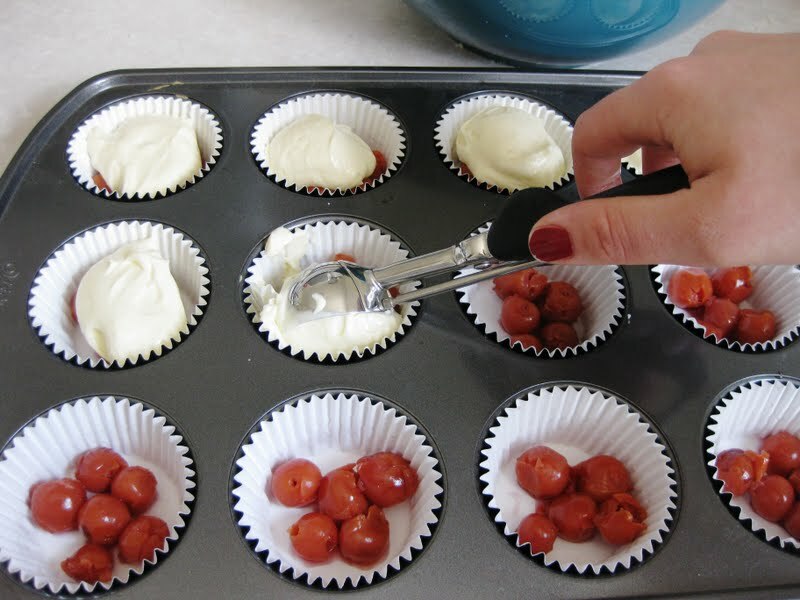 Place a dish with hot water right underneath the cupcake baking pan. The water will keep the cheesecake moist while baking. 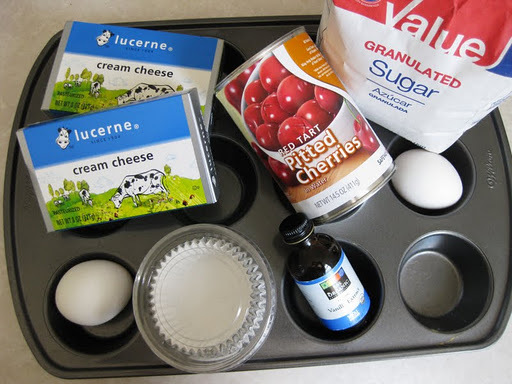 Bake the cheesecake cupcakes for 15 minutes. 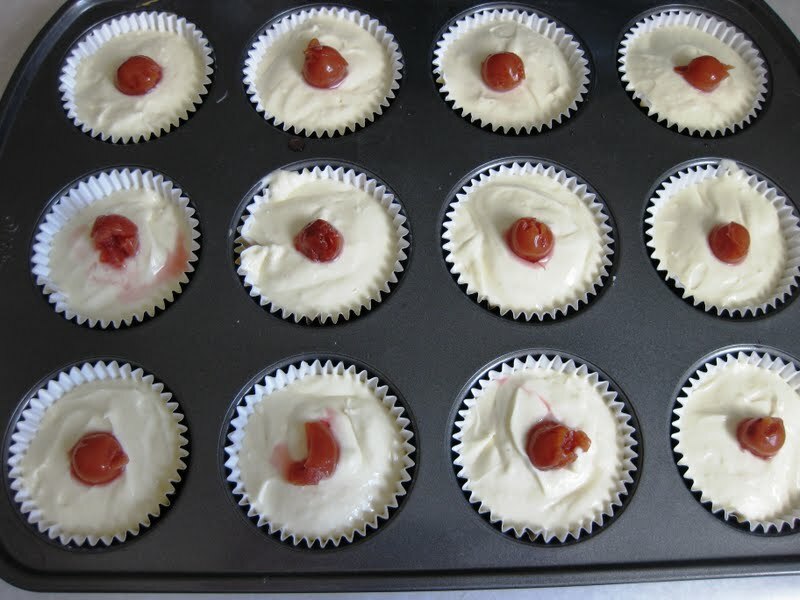 Turn off the oven and allow the cupcakes to stay in the oven for 30 minutes. 7. 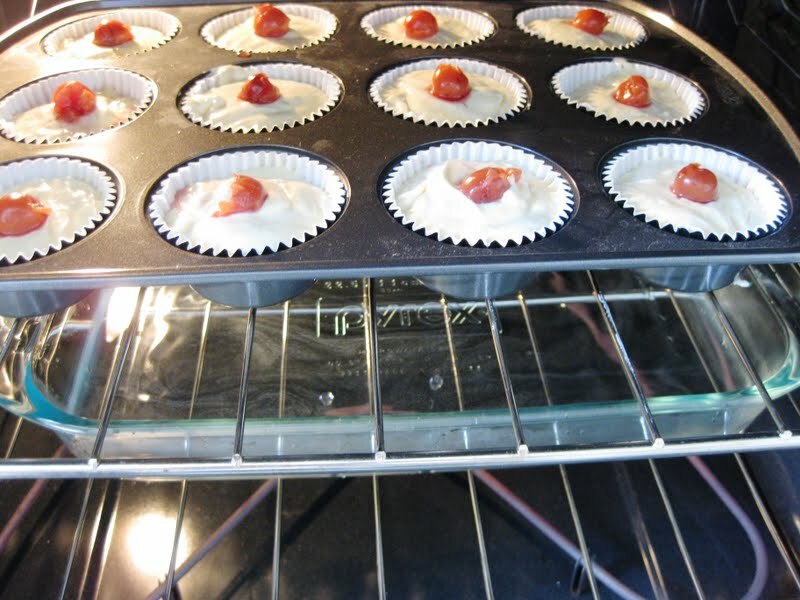 Remove the cheesecake cupcakes from the oven and allow to cool completely on the wire rack. Refrigerate, covered, until ready to use. 8. 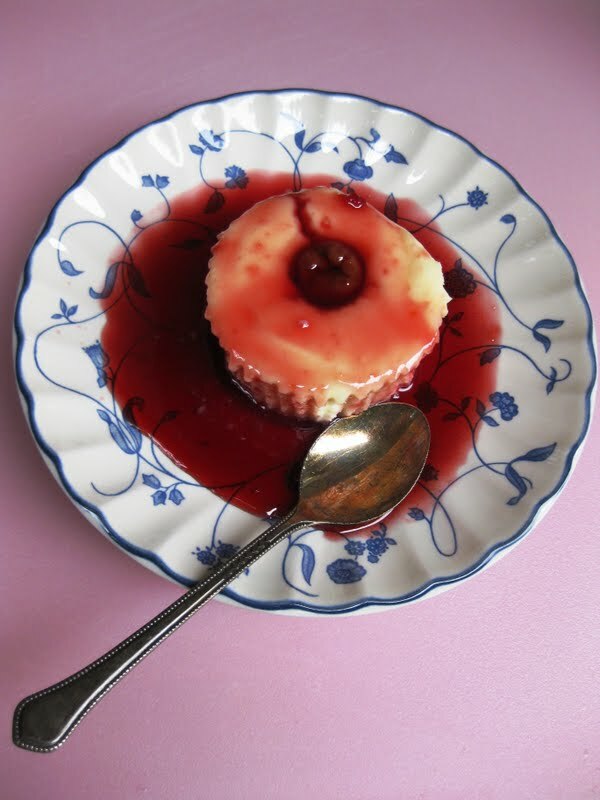 Before serving, combine cherry water or juice with 2 tablespoons of sugar in a small sauce pan. Bring to a boil over high heat, reduce the heat and simmer until syrupy. 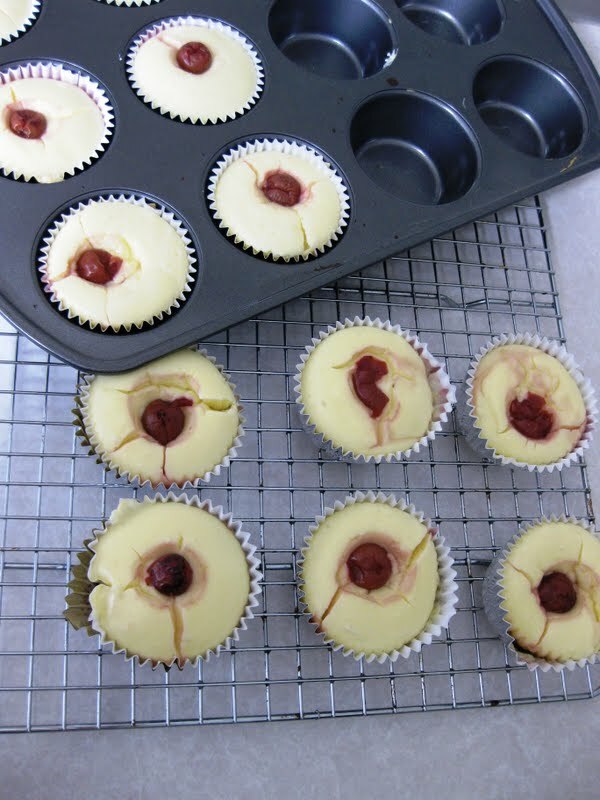 Cool slightly and pour over cheesecake cupcakes. Eat up! I have to admit, these turned out better than I expected – maybe I didn’t have high expectations. The recipe could be made richer by adding sour cream and heavy cream. I’m already dreaming of more variations. Perhaps raspberry, white chocolate and lemon. Have you seen Andy Cohen on Bravo TV? One of his shows is Watch What Happens: Live, where Andy hosts one or few guests from the popular Bravo reality show. What does this have to do with my blog? Well…patience! One of the segments on the show is Andy’s list of things he has been obsessed with during the week – it can be an outfit, a particular word, or an incident on one of the shows. So I thought – why not share my weekly obsessions with you? Here we go! While going through a stash of papers, I found a gift certificate to ChefShop that I received last year as a gift from Queen Anne Farmers Market. At the time, I was working at Kaspars, and Chef Kaspar and I did a demonstration at the market, grilling pizzas – vegetable and rhubarb. Fastforward a year later, the certificate was to expire the next day, and I had some shopping to do. I received great service from ChefShop and was opening a box packed with goodies just a few days later. This weekend I had the perfect occasion to try some of the goodies from the ChefShop box. 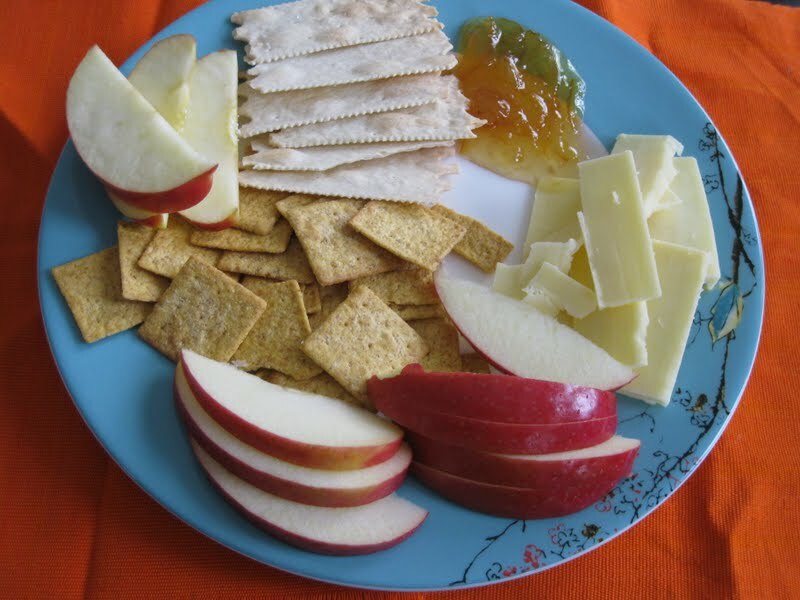 A good friend from Dallas was visiting me in Seattle, and as if we weren’t already eating and drinking enough, we thought that a cheese and cracker platter would be a lovely snack. 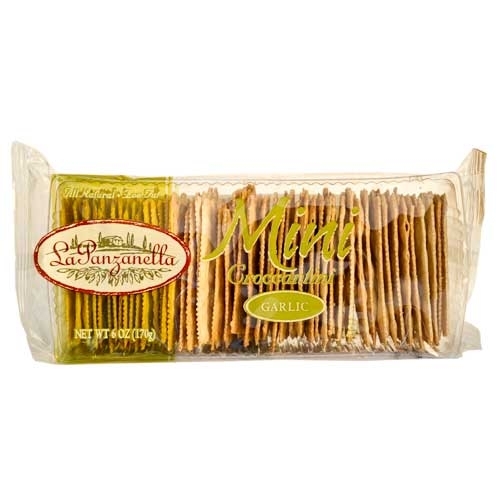 And now we are getting to my weekly obsession: Yuzu Marmalade, La Panzanella Garlic Flavored Mini Croccantini and Extra Sharp White Tillamook Cheddar (ok, the cheddar came from QFC, but the other two components were from ChefShop). Yuzu is a Japanese citrus fruit that is said to taste similar to a cross between tangerine and lemon. 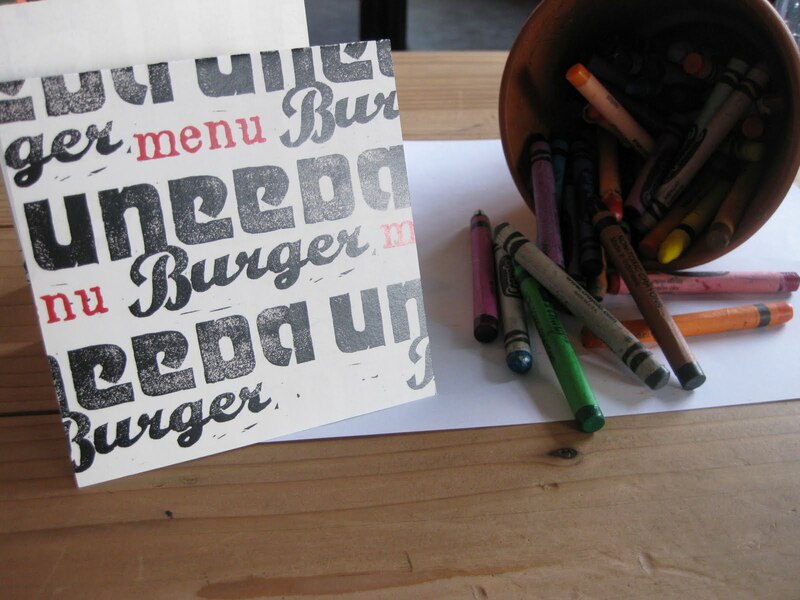 Depends on your taste buds, you might pick up different notes. 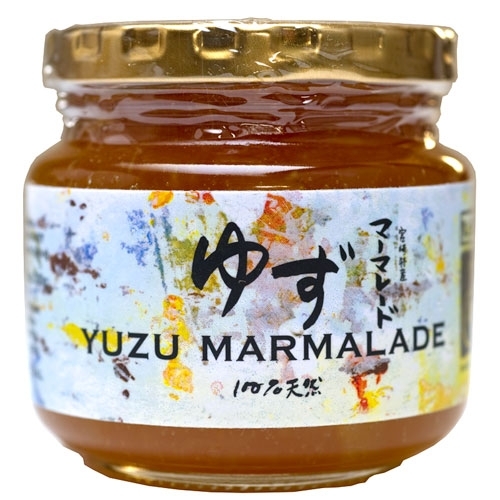 This Yuzu marmalade has only three ingredients – yuzu, sugar, and honey. To me, the marmalade taste a bit like orange marmalade, but more floral, with a bit touch of bitterness. But oh, so delicious! The La Panzanella Mini Croccantini might be more addicting than potato chips. They are dry and superbly crisp, with a slight hint of garlic. 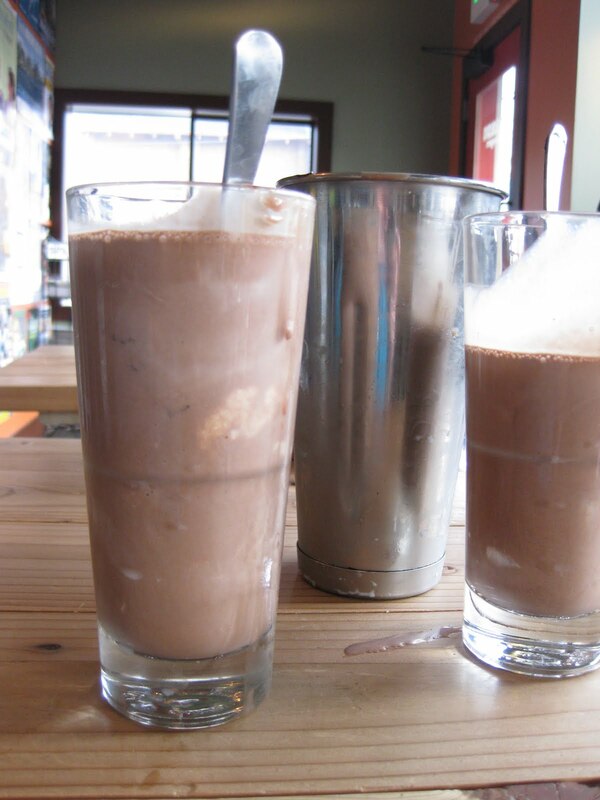 Try one, and you’ll have a hard time stopping. The choice of cheese was easy. 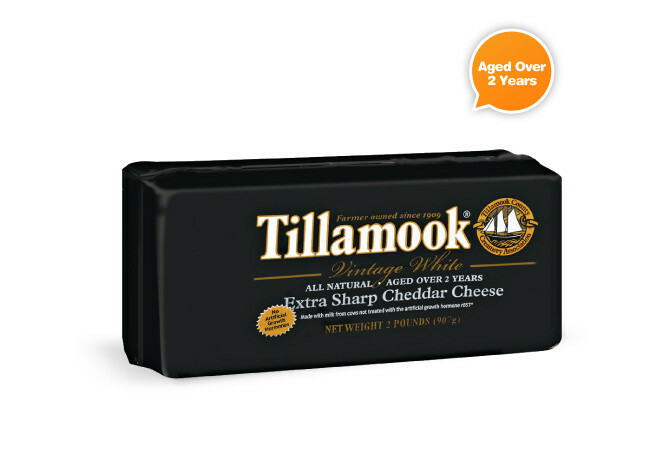 I wanted something local, thus Oregon Tillamook, and delicious – Extra Sharp Cheddar. Creamy and smooth, the sliced Cheddar made a perfect topping for the La Panzanella Croccantini spread with Yuzu Marmalade. 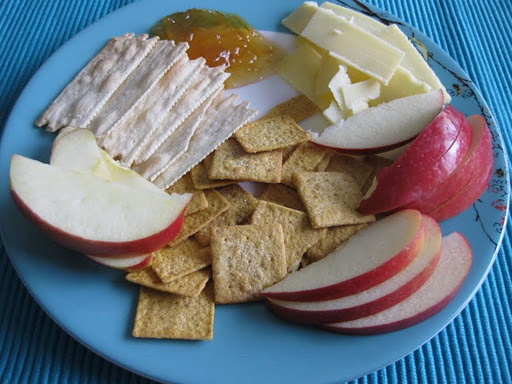 To round up our fruit and cheese platter, we added slices of fuji apple and some Wheat Thins (to be perfectly honest, I couldn’t be bothered with Wheat Thins and concentrated completely on La Panzanella crackers). And if you couldn’t tell by now, I’m also obsessed with orange and turquoise colors, and often put the two together. Let’s celebrate seasonal cooking and all it has to offer! Once a month, we’ll gather in the kitchen and cook with seasonal produce. May in the Northwest puts a spotlight on salmon, spinach, radishes, kale, and chard. If we’re lucky, we might get some ripe fruit stone – if not, we’ll borrow it from our neighbors in the south. A great class for a new or a seasoned cook! Learn proper cutting technique that will save you time in the kitchen. We’ll also save you some tears and cuts while teaching you how to slice, dice, chiffonade and julienne. Guest Eric Rose of AAA Sharper Edge will talk about taking care of your knives and keeping them sharp. Love to cook but intimidated by a long ingredient list? I have just what you’re looking for – a complete, delicious recipe with just five ingredients – thus, the Five Ingredient Dish. This is also perfect for Cooking for One, but can easily be multiplied to feed a family. Before we get to the recipe, let’s just decide that salt, pepper, and oil are not counted as ingredients. Capish? Bueno! Let’s move on. This is actually the second time I’m making and enjoying this recipe this week. First time, I made it for breakfast. Tonight, I had it for dinner. 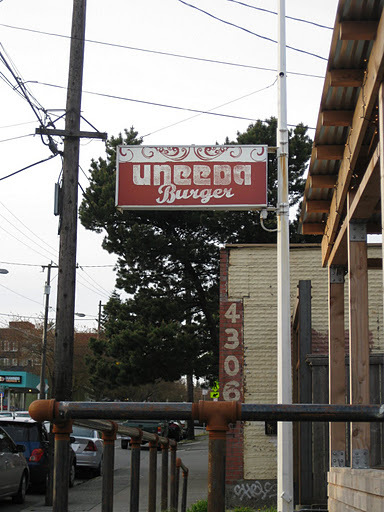 Lunch next? 1. 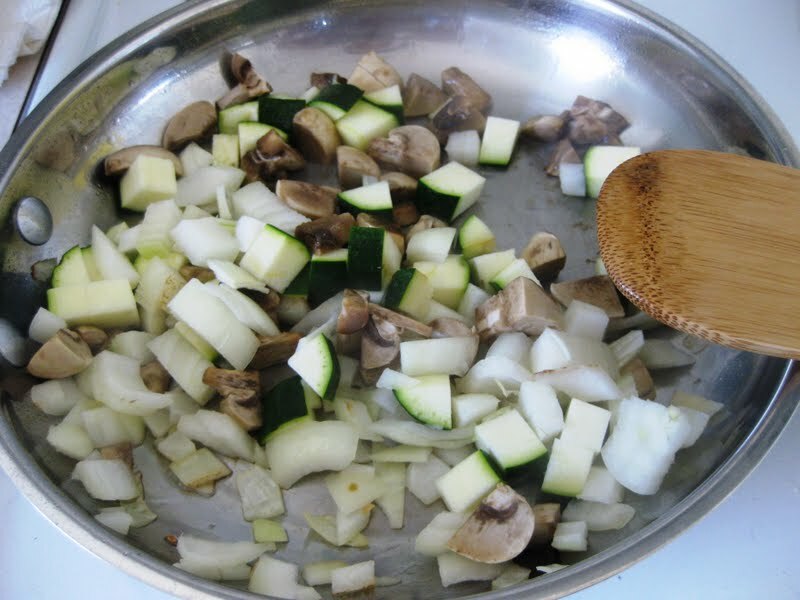 Heat vegetable oil in a medium size sauté pan. 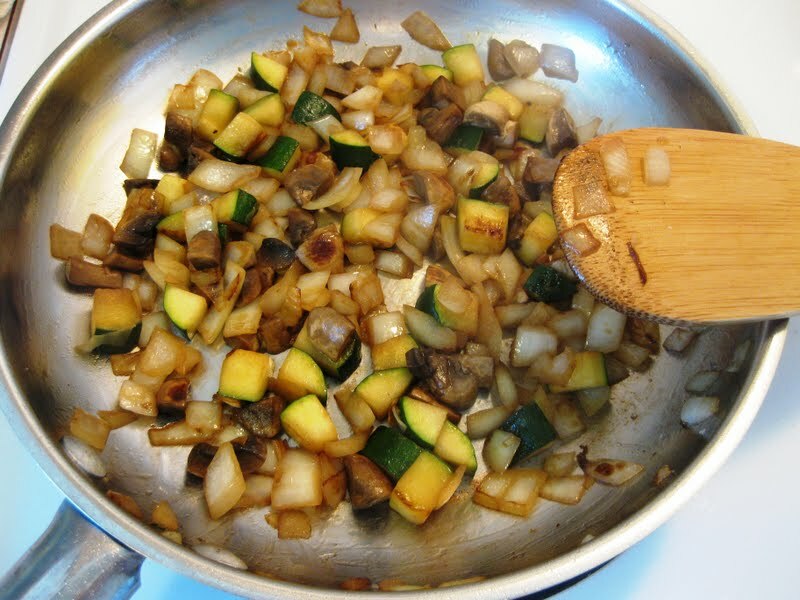 Add vegetables and sauté, stirring occasionally for 7-10 minutes, or until vegetables are tender. Season with salt and pepper. 2. Carefully crack 2 eggs on top of vegetables. Cover the pan with a lid and lower the heat. 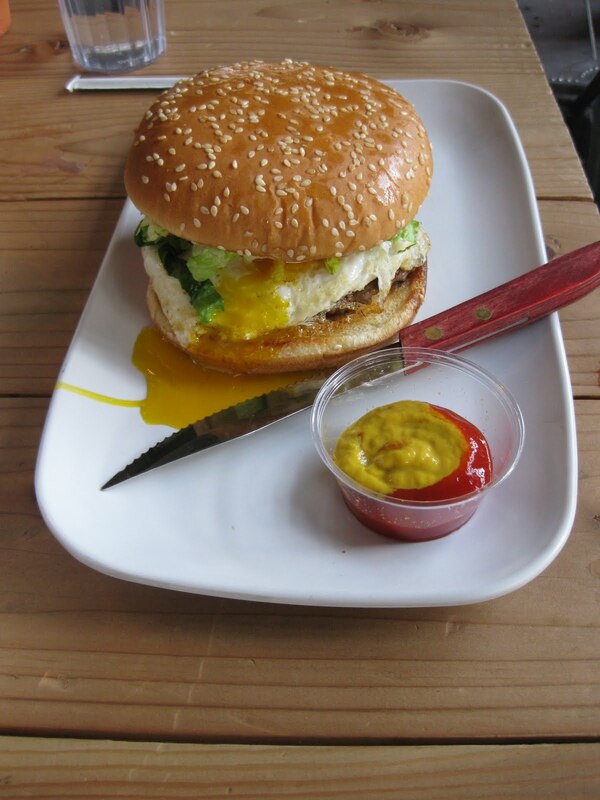 Cook until the egg white is completely set and the egg yolk is still runny, about 4 minutes. 3. 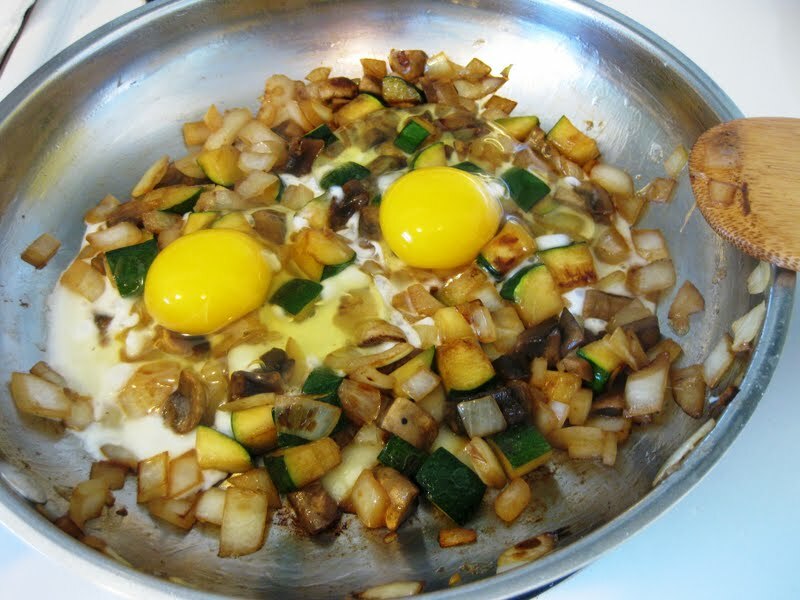 Transfer the eggs and vegetables to a bowl. 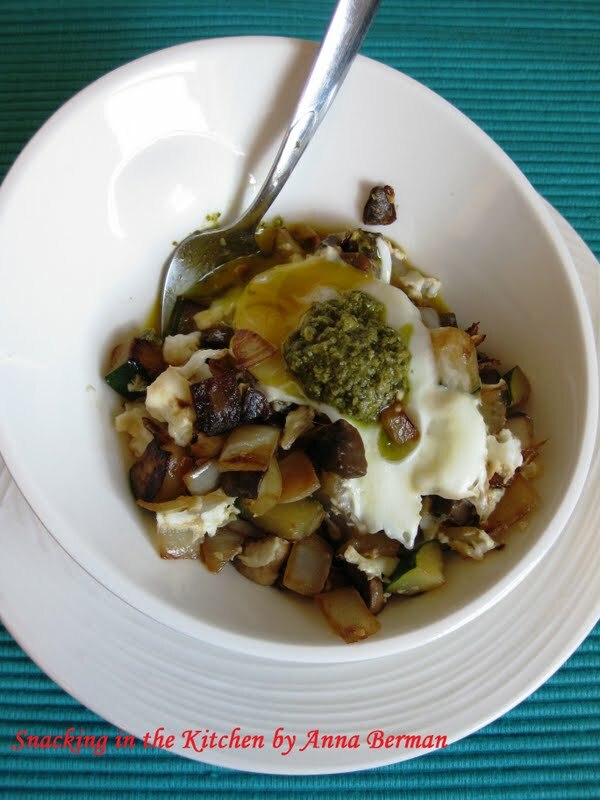 You don’t have to worry about breaking the yolk in this recipe. 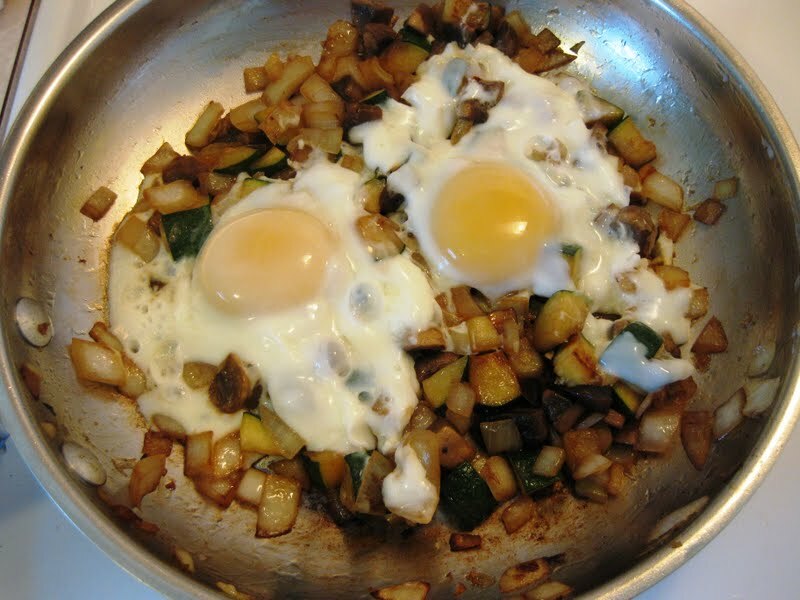 In fact, you want to break the egg yolk and mix the vegetables and the egg together – the egg creates a creamy, delicious sauce. 4. Add pesto and mix again. Time to eat! Have a favorite 5 Ingredient Dish? Please share! Here are the classes I’m teaching this week at Whole Foods Market in Redmond, WA. Please call to sign up for the class. Host a Mediterranean style tapas party for your next gathering with friends and family. Enjoy these bright, fresh flavors in your own kitchen. Our Healthy Eating Supper Club is back! 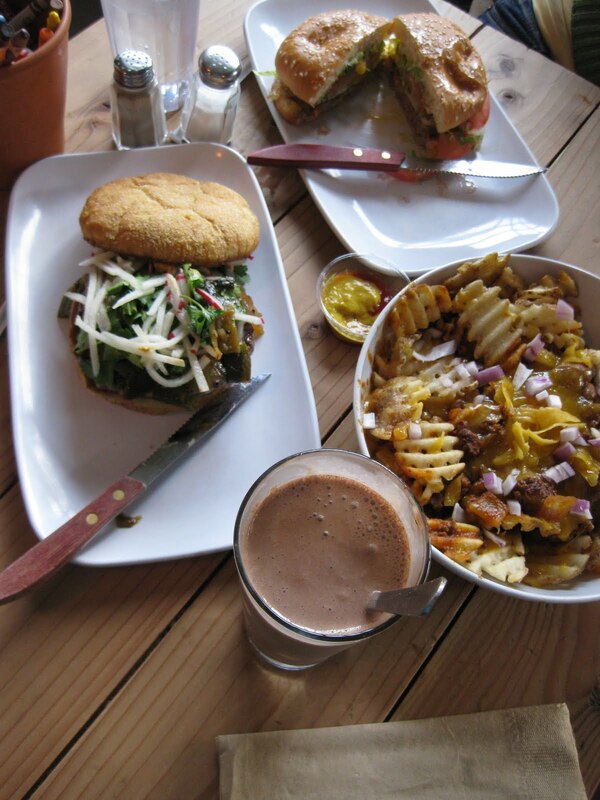 Enjoy a delicious and healthy meal prepared just for you! During the meal we will talk about how the dishes were prepared, why we chose certain ingredients and have a discussion around healthy eating topics. Bring your appetite and your questions! I have a lovely group of friends in Seattle that I call “My 4th of July Russian Girls.” The nickname for the group was born last year over the 4th of July weekend that we spent together. I felt as though I was initiated into the group that weekend. Thanks ladies! We spent most of that weekend eating and drinking and hanging out. We continue to eat and drink together. I’m not going to go into details of our particular taste buds, but let’s just say that sharing a dish containing cilantro and onions will never happen. 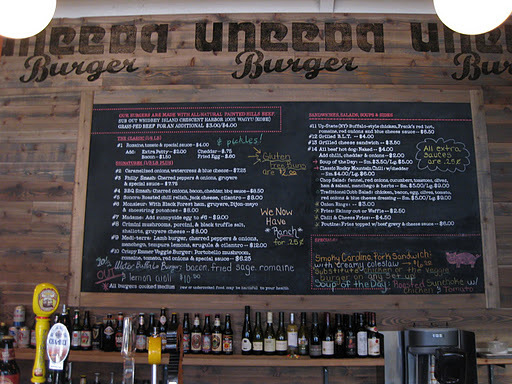 Deciding where to eat can be highly challenging and usually leads to heated discussions (slightly over exaggerated). Our safe places tend to be Pho or Thai. The last time we got together, I attempted to push our boundaries and suggested we try something a bit more exotic. 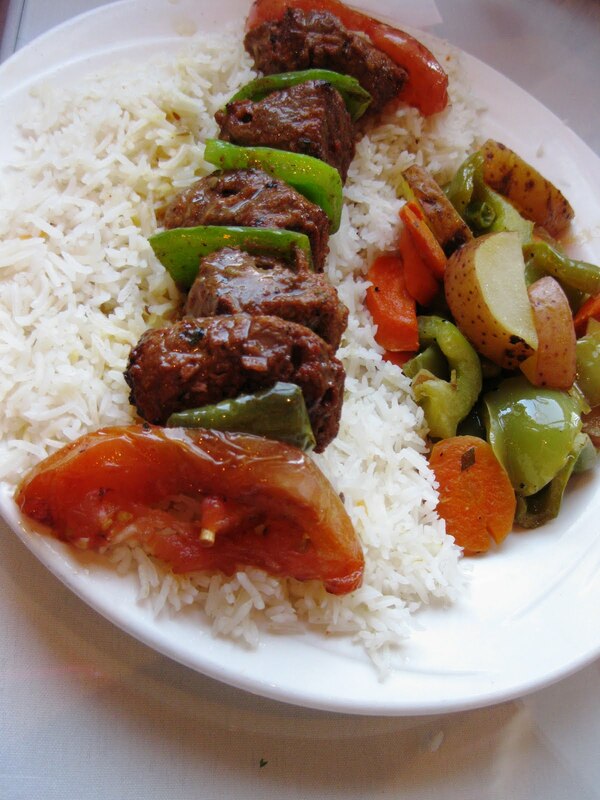 Following a 4-way back and forth chat on gmail, we agreed on Saffron Grill -a Seattle restaurant located in Northgate offering “inventive fusion of Indian and Mediterranean cuisine.” I have shared several meals at the restaurant before and was looking forward to coming back. 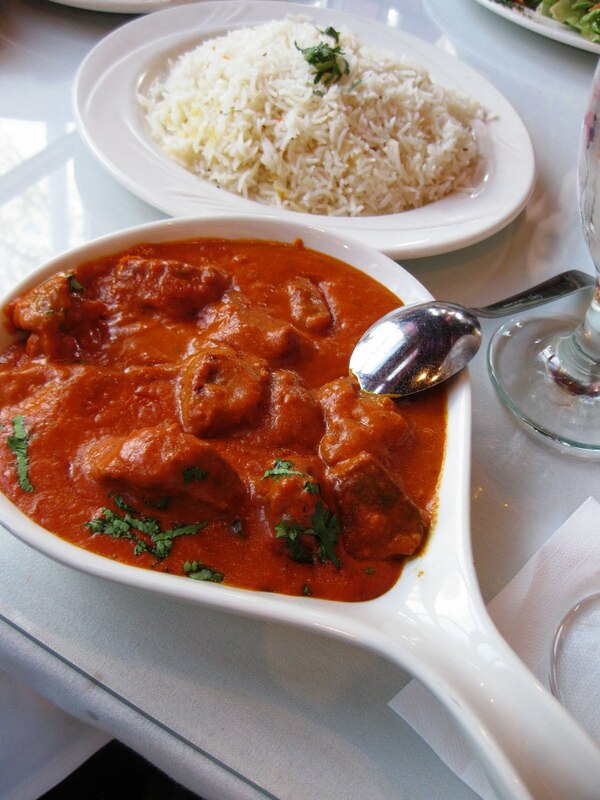 I was also very excited to introduce Indian cuisine to one my friends. When it came to ordering, let’s say we went slightly overboard. 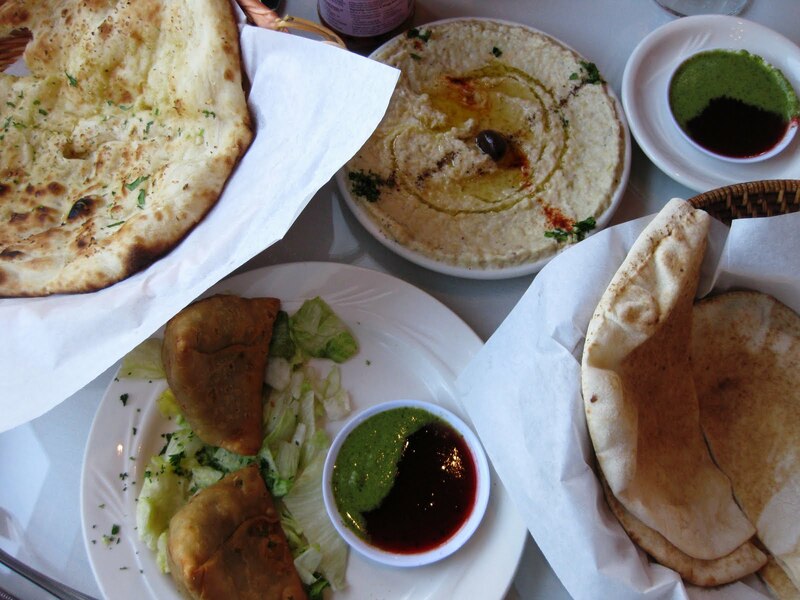 The menu offers plenty of traditional Indian items (curries, tandori, etc), Mediterranean items, and some American options (we couldn’t refuse an appetizer plate of garlic fries with Ranch dressing). 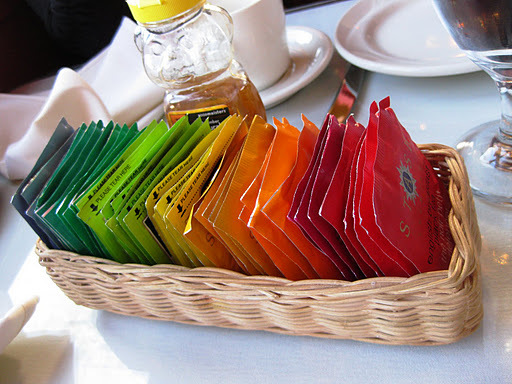 Let us start with tea – there was quite a selection, artistically organized by color! I ordered a virgin Mojito, and the drink order was completed with a beer and a gorgeous Tropical Sunrise (layered drink of strawberry puree, orange juice and pineapple juice). The appetizers began to arrive – vegetable samosas (with potatoes and peas), baba ghannoj (smoked eggplant pureed with tahini sauce – by far one of my favorite items of the evening), garlic fries with Ranch dressing (don’t judge), and a complimentary order of garlic naan (hot, fresh out of the oven, fluffy pillow of dough with garlic and ghee). How we managed to find room in our stomachs for dessert, is honestly beyond me! 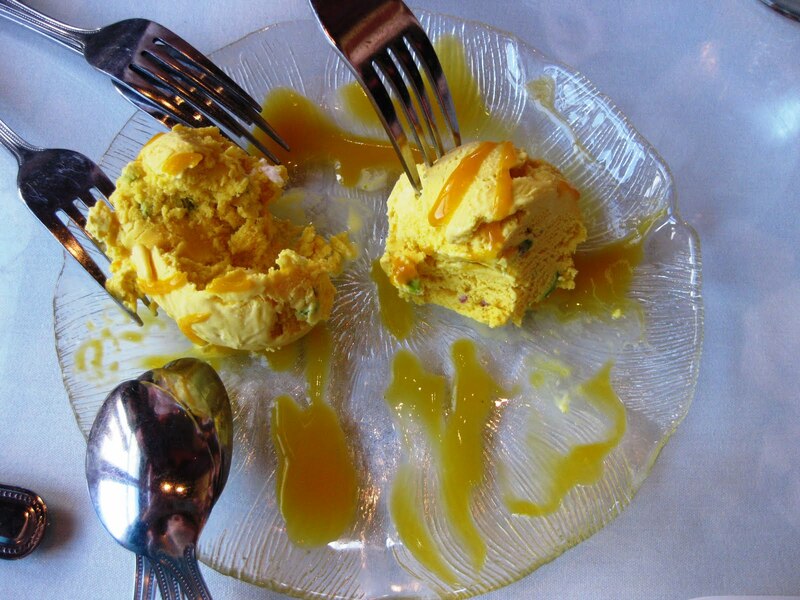 But we did order a plate of mango ice cream with pistachios that was devoured in record time. 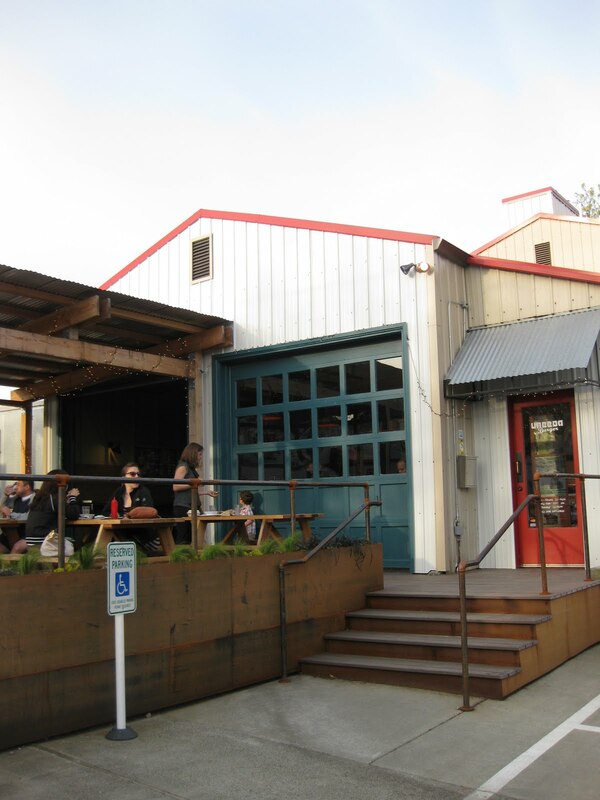 Saffron has a daily happy hour 2-7pm-one more reason to visit. “I’m going to make risotto for mom!” I told my sister. It was Mother’s Day, and I wanted to make dinner. “Risotto? Mom thinks it’s like a rice porridge.” she said. “Really? Well, I bet she just didn’t have a good risotto yet. Perhaps I can change her mind.” I was ready for a challenge! I’m not sure if I changed her mind, but she did enjoy the risotto, and my dad went for seconds. 1. Heat olive oil in a medium size heavy-bottom pot, over medium high heat. 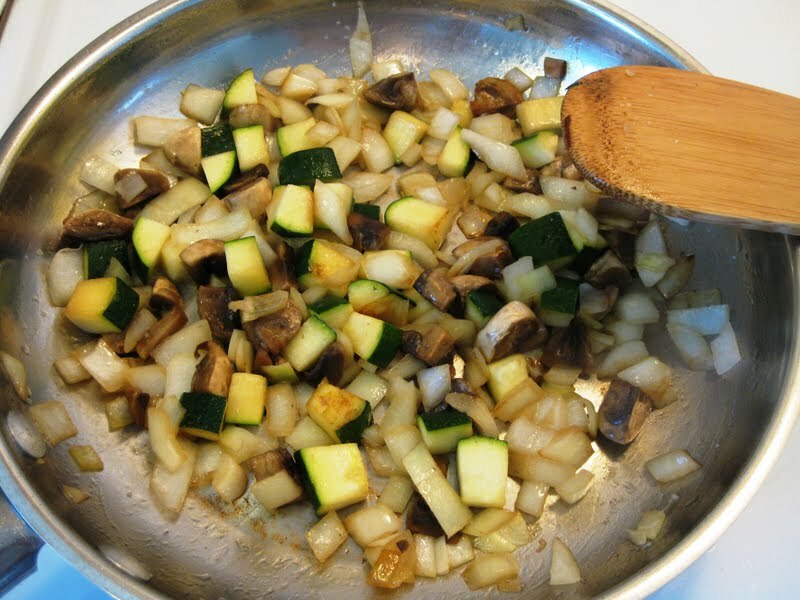 Add onion, mushrooms and saute for 7-10 minutes until the onions are soft and mushrooms have browned. Remove from the pan, and set aside. 2. Bring chicken broth to a boil, lower to the heat, and keep the broth at a low simmer. 3. Add rice to the medium size pot (where you cooked onions and mushrooms). If needed, add more olive oil. Toast rice in oil for 3-5 minutes, stirring occasionally. Add the wine and cook until the wine evaporates. 4. Time to add the hot broth! (You really do want it hot – that will help the risotto to cook more evenly and quicker). Add only about 1 cup of broth at a time, waiting until the liquid almost evaporates before the next addition. 5. Test the rice – taste it. You want it to remain its bite, but not be crunchy. Don’t feel like you have to use all of the broth. 6. Once you are happy with the risotto consistency, add the mushrooms, cheese and dill. Taste and adjust the seasoning with salt and pepper. Serve immediately! What are your favorite risotto stir-ins? Join me and learn how to cook in a fun, casual atmosphere! 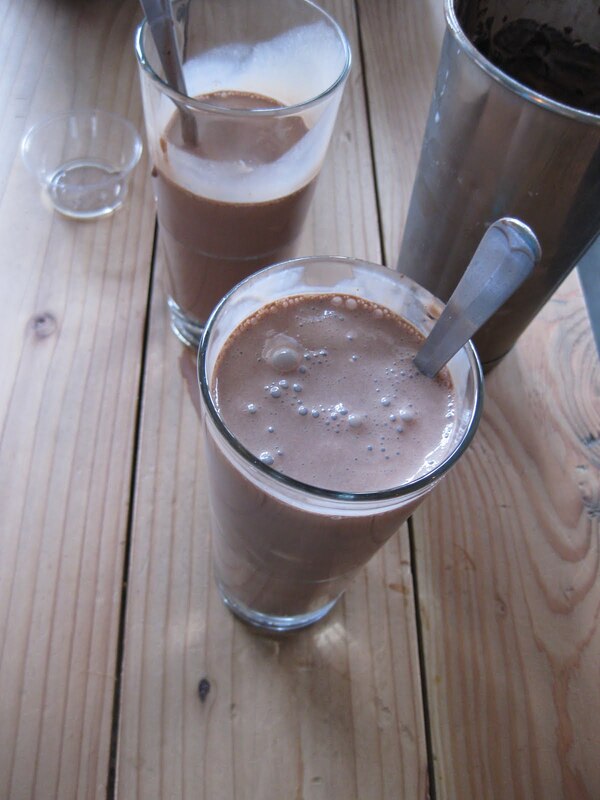 We had so much fun this winter making 4 soups in one class, I thought we should do it again. Let’s take our winter-favorite heart warmers into Spring with lighter, yet still filling and delicious options! 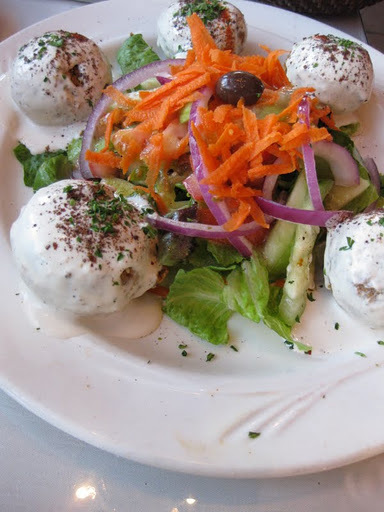 These small delicious plates are perfect to share with your friends and family. Full of flavor, they’ll satisfy even the pickiest of eaters. When this Mother’s Day approached, I asked my mom what would she like me to cook for dinner. Surprisingly, she had something else in mind – she wanted me to clean her refrigerator. As glamorous as it might be, this wasn’t exactly my idea of fun, but since I asked, I could hardly refuse her. So there I was, over at my parents’ house, cleaning the refrigerator after spending 6 hours working in a busy bakery on Mother’s Day. But the story doesn’t end there. Afterall, I showed up to the house with a bouquet of flowers and a bag of groceries – there was dinner to be made! 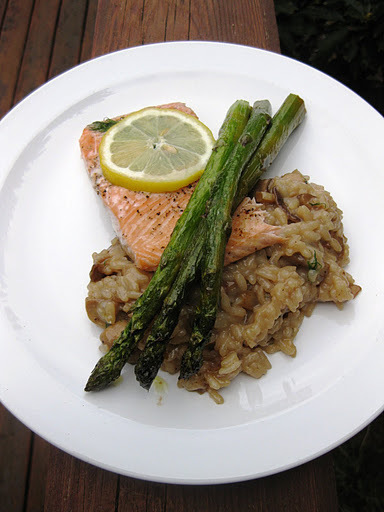 I decided on Mushroom and Dill Risotto, Roasted Salmon with Dill and Lemon, and Roasted Asparagus. (Photographing risotto turned out harder than expected). 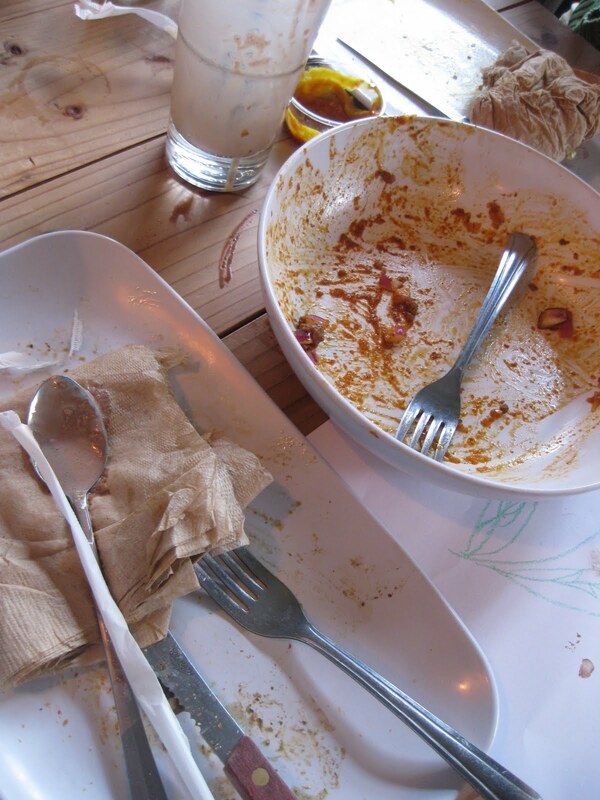 What did you cook or eat this Mother’s day? 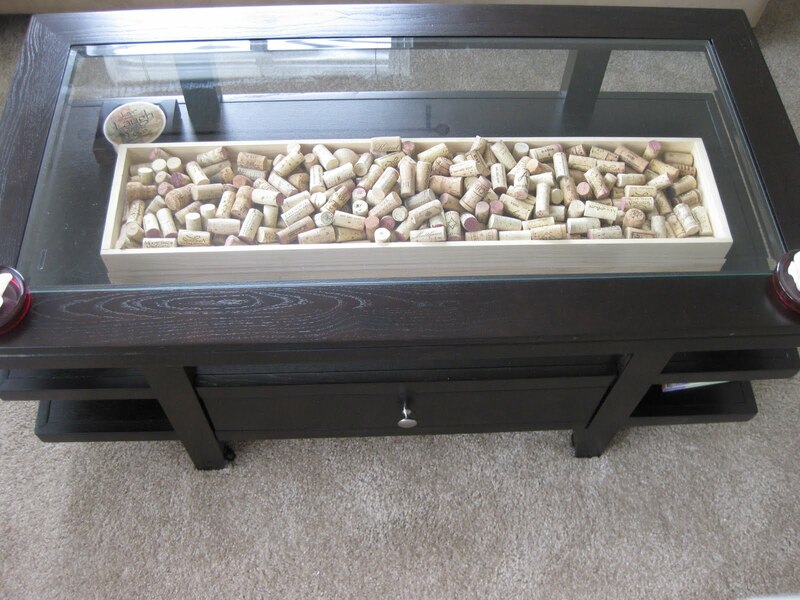 What to do with wine corks? In the last few years, I’ve lived in 4 states (I promise, I’m not running away from law). Each time I moved, I packed my car to the bream with my most valued possessions. 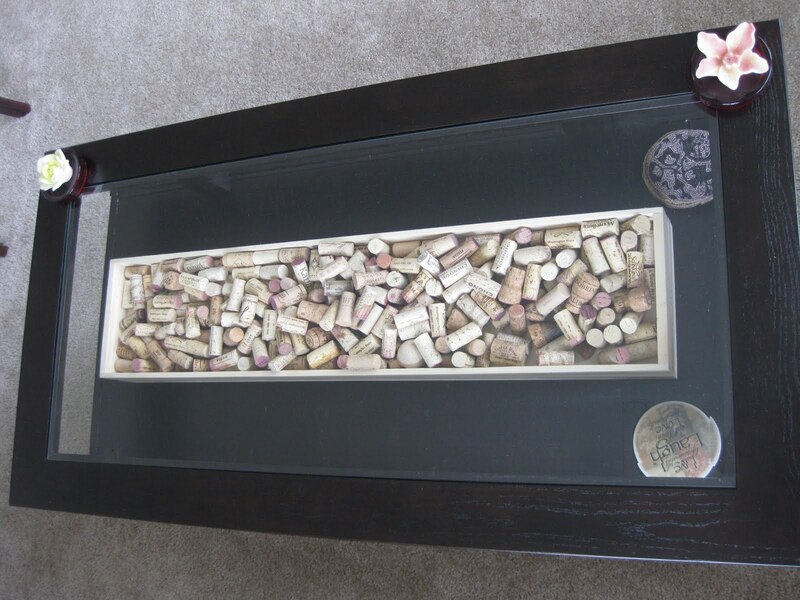 One of those possessions was a large box of wine corks – saved over the years from wine bottles. The box also contained a few champagne corks, a few corks from good bottles of balsamic vinegar, and some corks donated by friends. Each time, I would look at the box of corks and wonder – what am I to do with it? Making a cork board, a trivet, or even a reef has crossed my mind, but I just haven’t gotten to it. At least not yet. So for now, I came up with this idea. I recently finally invested in some furniture, and the coffee table arrived yesterday! I love the extra storage that it provides and decided to take advantage of the glass top for display purposes. Using a wooden tray (recycled from a catering gig), I filled it with the corks and voila! Glass of wine now? 🙂 If you have any extra wine corks and would like to donate them, please let me know!